The Scottish government’s budget plans for the coming year are to be formally approved by the Scottish Parliament. The budget will widen the gap between how much income tax higher earners in Scotland pay compared to the rest of the UK. But it will also provide extra funding for education, the health service and infrastructure. The SNP government struck a deal with the Scottish Greens last month that will ensure the budget passes. As part of the agreement, councils could be given new powers to introduce taxes on workplace car parking spaces and tourism – with the government also agreeing to increase core local government funding by £90m and to hold cross-party talks on replacing the council tax. Will you have to pay to park at work? Local authorities will also be able to increase council tax by up to 4.79% rather than 3%, with the government also committing in principle to introducing a charge on disposable drinks cups – a so-called “latte levy”. The Scottish Conservatives are strongly opposed to the workplace parking tax, which the party has claimed will hit low-paid workers hardest. And Scottish Labour has insisted that councils are still facing a real-terms cut in core funding, which will lead to cuts to local services. The final vote on the budget will be held at 17:00, with the debate starting at about 14:30. There will be full coverage on our Holyrood Live page. How much income tax will you pay? When he first unveiled his budget proposals, Finance Secretary Derek Mackay confirmed he would not pass on a tax break for higher earners that was announced by UK Chancellor Philip Hammond in October. Mr Mackay has done this by freezing the higher rate threshold at £43,430 in Scotland – while it will go up to £50,000 in the rest of the UK from April. It means people earning £40,000 in Scotland will be £130 a year worse off than their equivalents elsewhere in the UK, increasing to a gap of nearly £500 a year for those on £45,000. The proposals also mean that everyone earning under £27,000 in Scotland – about 55% of taxpayers – will pay less income tax than those on the same salary elsewhere in the UK. But they will only be a maximum of just over £20 a year better off, according to economists at the Fraser of Allander Institute. Mr Mackay has also said everyone earning under about £124,000 in Scotland will pay less tax than they did last year. Read our full at-a-glance guide to the Scottish budget here. What has Mr Mackay said about his budget? The finance secretary has previously said his budget “prepares our economy for the opportunity of the future, enables the transformation of essential public services, and builds a more inclusive and just society”. He has also insisted that “now is not the time to cut tax for the highest earners at the expense of our public services” – arguing that not passing on the tax break given to higher earners elsewhere in the UK will raise an additional £68m for Scottish public services. But he has warned that he may have to change his budget plans if the UK leaves the EU on 29 March without a deal. 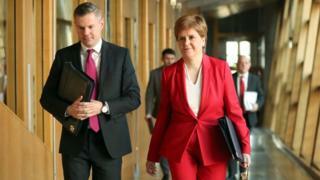 Ahead of the budget vote, the Scottish government repeated its warnings about the potential impact of a no-deal Brexit on Scotland, which it has claimed could push the country’s economy into recession. In an analysis paper, it suggests Scotland’s Gross Domestic Product (GDP) could fall by up to 7%. Trade with the EU would also expected to be “significantly impaired”, with a forecast for a potential drop in Scottish exports of between 10% and 20%. Mr Mackay has previously said he may have to introduce new budget measures if the UK leaves the EU on 29 March without a deal in place. The UK government has argued that the best way to avoid no-deal is for MPs to back the prime minister’s proposed deal with the EU – which the SNP has voted against. The budget will pass with the support of the Scottish Greens for the third year in a row. The party says its agreement with the government “provides councils with longer-term stability through multi-year funding deals, greater autonomy with plans to devolve powers over local taxes, and a commitment to work on a replacement for the outdated and unfair Council Tax”. However, the Scottish Conservatives have described the budget as a “triple tax bombshell” which will do nothing for the competitiveness of the Scottish economy. The Tories have also accused Mr Mackay of breaking promises to voters not to bring in a tourist tax or raise council taxes by more than 3%. Scottish Labour has said it will vote against the budget as it would “would never sign up to a budget that has cuts to local services in it”. And Scottish Lib Dem leader Willie Rennie has said the Greens were “bought cheaply”, with Mr Harvie having “settled for the vice-convenership of the car parking working group”.